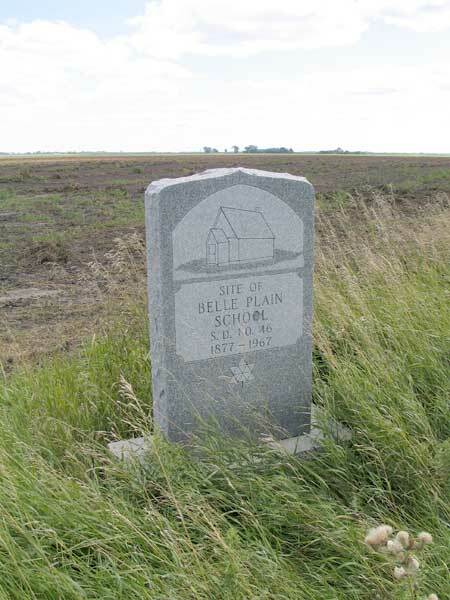 Belle Plain School District was organized in March 1877 and a log school building was erected in the northeast corner of 19-12-7 west of the Principal Meridian, in the Rural Municipality of Portage la Prairie. In 1895, a new frame building was erect across the road from the original one, in NW20-12-7W, and the earlier school was used as a school barn until 1950 when it was torn down and its logs were used in the construction of another building. 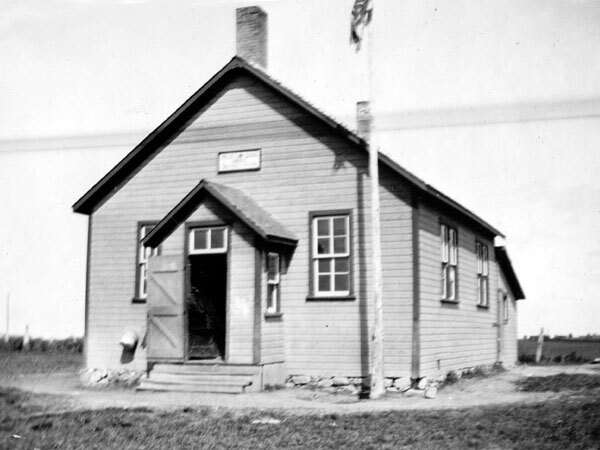 The school was closed between August 1939 and June 1941 due to lack of students. It closed permanently in June 1965 and the remaining students went to Macdonald Consolidated School No. 2401. The school building was sold and moved to the site of the Bruce Barn for use as a workshop. A monument was unveiled in 1967. The teachers of Belle Plain School were David W. B. McKay, Margaret Ann Campbell, Sarah Clarke, John Freeborn, Louisa Hill, Jessie Ptolemy, Agnes C. Laut, Minnie A. Ranton, Carter, Johnny and Emma Scott, Eda Wilson, Emeline Scott, R. Gardner Taylor, T. A. Broadfoot (1897), William H. Burns, H. J. Everell, Lizzie Ross, Maude J. Kerr, Edythe Garland, Agnes Brydon, Mary V. Springstein, Mildred Trimble, Grace G. McArthur, Margaret L. Fletcher, Hazel Martin, Gertrude C. Hurton, Maude Pogue, Amy J. Roe, Madeline Bradshaw, Eva P. McKelvey, Sarah R. Craig, Jean McMaster, Gladys M. Caskey, Kathleen Beckett, Maybelle Curtis, Violet R. Wilds, Fred Hyde, Beatrice R. Hyndman, Clara Chritchley, Mildred Tidsbury, Charlotte M. Finlay, Wm. M. McMillan, Elsie Burton, Helen Sanderson, Anne Henderson, Winona Horner, Reta Delgatey, Rosemary Matthews, Louise Cook, Shirley Dalgarno, Velma Kolesar, Marionne Sykes, Ila Morgan, Betty Boyachek, Sheila Foxton, Reva Cairns, Lynn Andres, and Mrs. Flora Bell. GR8461, A0233, C131-1, page 15. “The last barn standing” by Robin Dudgeon, Portage Daily Graphic, 25 February 2012, page 12. We thank Glen Lloyd for providing additional information used here.